Flameless heaters can work wonders when it comes to cleaning up restoration worksites or pest control. Therm Dynamics has a flameless heater that can solve all your restoration projects and unwanted pests that is not only safe for you and the environment but also the most reliable heater and portable heater on the market today. Flameless heaters are an excellent source of thermal heat for drying up worksites or heating up rooms to kill unwanted pests with clean, breathable air. Undergoing a restoration project is never fun or easy especially in the cold winter months or right after a heavy rain that caused flooding. Waiting around for the weather to change or a restoration worksite to dry up costs time and money. With a thermal flameless heater from Therm Dynamics you’ll never worry about freezing or waiting for flood waters to recede in order to resume your restoration project. Flameless heaters for restoration projects are the safest and most reliable heater on the market today. 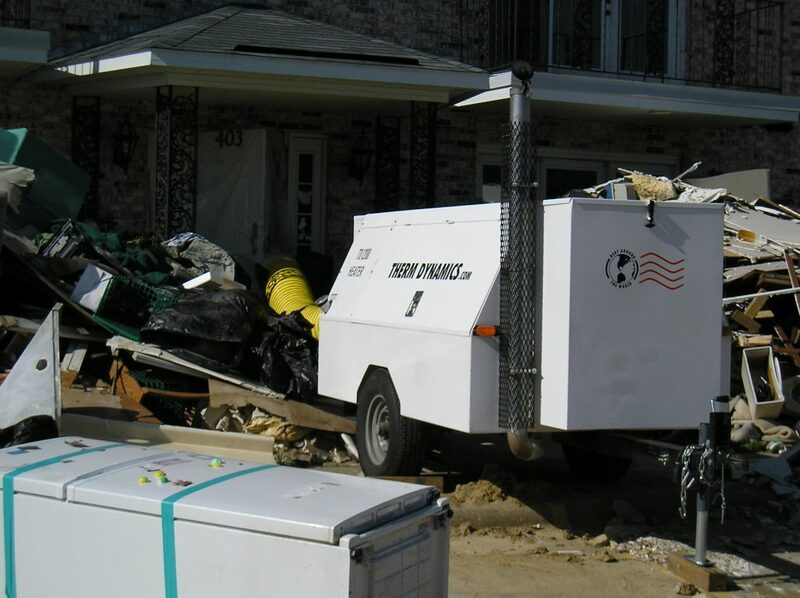 Flameless heaters are not only beneficial for restoration projects during extremely cold weather but they also are helpful if your property is in need of flood restoration, if you need temporary heating for concrete curing, moisture removal, or paint drying. Therm Dynamics heaters run on diesel or electrical power. Not only are flameless heaters safe for the crew working on the restoration project, they are also safe for the environment. If you are in need of flood restoration, disaster restoration, or other restoration projects requiring thermal heat, get a flameless heater from Therm Dynamics today! Let Therm Dynamics flameless heaters help eliminate temperature and water obstacles so you can resume your restoration project. When it comes to pest control, no one wants to have to deal with constantly killing those annoying pests. Therm Dynamics has flameless heaters that are designed to take on and knock out any annoying pest roaming around your home, business, or worksite. A flameless heater from Therm Dynamics has the ability to treat pests throughout a work area. Thermal pest control is the safest, most reliable and economical method of pest treatment. Thermal pest control works by sterilizing properties infested with unwanted guests. All Therm Dynamics flameless heaters for pest control heat treatment purposes are equipped with the safest and most reliable materials. All Therm Dynamics pest control heat treatment heaters are portable and can operate for over 30,000 hours of successful operation. Therm Dynamics pest control heat treatment moves warm air through the entire structure until it reaches the appropriate temperature therefore killing all bugs and eggs while keeping all contents within your structure safe. Thermal pest control can be applied to any structure of any size. Therm Dynamics flameless heaters are the safest heater for thermal pest control using NO chemicals; only electric energy or diesel fuel. Thermal pest treatment is instantaneous; no pre-heating or preparation is needed. A flameless heater from Therm Dynamics for thermal pest control is portable and rentable. No need to invest in purchasing a flameless heater to get rid of those unwanted guests. Our flameless heaters can be rented for pest treatment purposes. Contact Therm Dynamics to get more information on our flameless heaters for pest treatment and restoration projects.